Feminist therapy has been challenging mainstream therapy thinking and practice for the past thirty years. 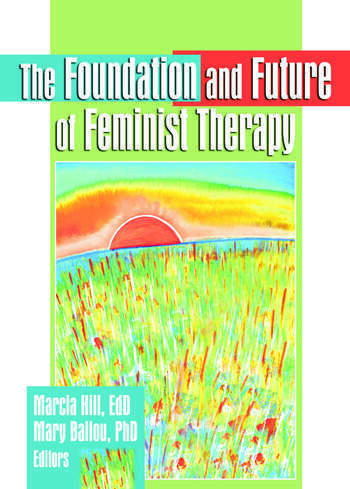 The Foundation and Future of Feminist Therapy is the first book to provide a summary and compilation of that history. It describes the work of the major contributors, early and recent, and gives a terrific overview of the rich and radical development of feminist therapy from a variety of perspectives. The Foundation and Future of Feminist Therapy honors the work of women such as Laura Brown, Iris Fodor, Miriam Greenspan, Hannah Lerman, and Lenore Walker, who developed, and who continue to develop, feminist therapy theory and practice. This book breaks new ground by envisioning a feminist-informed future in the areas of therapy practice, the education of therapists, and community. It also provides an unflinching look at the challenges and threats to developing that future and offers suggestions for action. For those interested in feminist therapy theory, The Foundation and Future of Feminist Therapy is an excellent starting point, and many references are provided for readers who want to pursue specific topics further. This book will interest practicing therapists at all levels, including psychologists, counselors, and social workers. It is also appropriate as a textbook for women’s studies, psychology of women, counseling, psychology, and social work classes.